How Bad Science and Emotional Appeals Spread Disinformation. 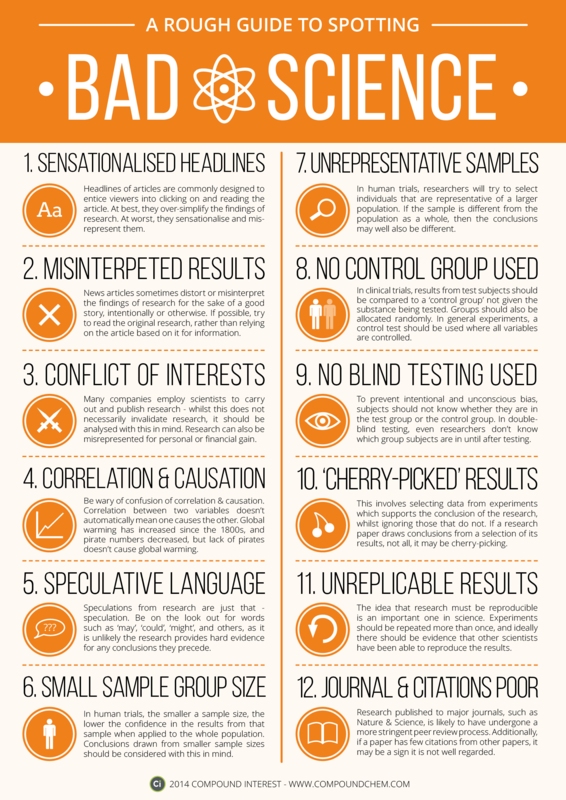 In today’s world, there is more false and misleading “information” than there is good science that is based on facts and not emotions and mythical or wishful beliefs. Much of what you see is either false or overblown. How can you know what to believe? It’s easy for me to say “Do your own research,” but that is often asking too much of most people who do not have analytical minds which have a habit of using critical thinking, much less have training in interpretation of scientific testing and results. Today’s sensational and social media agenda are often driven by emotions, ideologies, politics, commercial aims or just plain stinking thinking. The image above can help you understand factors that are important to discern fact from fiction, speculation and mythology. Anecdotal stories do not constitute facts. Correlation does not mean causation. The flawed reasoning goes something like this: John ate a lot of apples. John got heart disease or cancer. Therefore, apples (or some chemical on them) caused John to develop heart disease or cancer. More examples of people who ate apples and got heart disease or cancer do not constitute proof that they cause disease. Correlation does not mean causation. Maybe it is just two unrelated facts that are paired for sensational effect or to intentionally mislead you. In humans, there are a lot of lifestyle and workplace differences between people, so one factor (apple) cannot be said to be a cause of anything without taking into consideration what else could contribute or cause the effect. Other factors such as obesity, alcohol, smoking, sedentary lifestyle, sleep habits, age, heredity, other risky behavior, etc. have to be ruled out in closely controlled studies. Small numbers of examples that seem to support the premise do not constitute “clinical trials” or proof. To be statistically significant, very large numbers must be included along with control groups that do not use the suspected substance, preferably in a double blind study. (double blind means neither the subject or the person giving the substance know which are real and which are placebo so their attitude cannot affect the result.) I’m sorry, but Reader’s Digest and Facebook “statistics” are often flawed and any conclusions must be questioned and examined closely, even if it seems to come from a reliable source or even your grandmother. It is wise to consider the source. There are powerful advocacy groups pushing agendas having nothing to do with real science or caring for your safety, which they claim. These include anti-vaxx, organic anti-modern agriculture, anti-pesticide, anti-fossil fuel, in general anti-human progress groups that influence national and international agencies to act out of a preponderance of caution. The precautionary principle, used in the European Union, stops all progress in its tracks. If a substance with no presently known safety issues may possibly, conceivably cause some unforeseen harm in the future it cannot be used. It is also unscientific because it demands proving a negative. Word to the wise: Be cautious and suspicious of any health claim you read or hear about. There is often an agenda driven ideology or money-making scheme behind it. Another climate panic collapses: recent harsh winters have killed off invasive pine beetles thought to be linked to global warming — Watts Up With That? via Another climate panic collapses: recent harsh winters have killed off invasive pine beetles thought to be linked to global warming — Watts Up With That? Lecturing democratic nations. How dare they.